Maryland has some of the strictest gun laws in the entire country, and despite years of lobbying by gun rights groups such as the NRA the strict gun laws here have remained. On the other hand, recent developments in the Court of Appeals, and possible future developments in the United States Supreme Court may soon trigger modification of gun possession, and gun carry laws. For now though, police officers will continue to enforce the state’s harsh gun laws and arrest anyone whom they think may be in violation. One of the most common gun charges in the state is wearing, carrying, or transporting a concealed or open handgun. The law does not consider openly carrying a handgun or carrying a concealed handgun as different crimes. Without a difficult to obtain permit, both are illegal. The Herbst Firm understands that an arrest and prosecution can have serious consequences for a person’s future. Our lawyers have real trial experience defending clients charged with gun crimes and we will fight to have your charges dropped or dismissed. A defendant can be charged with carrying a concealed handgun on his or her person, or in a vehicle. Each year, hundreds of people are arrested for carrying or transported handguns while driving, and there is quite a bit of confusion over the gun possession laws while driving. To be clear, it is not legal to drive in the state with a handgun without a permit unless the owner takes a variety of safety measures. The owner may only transport a gun for a legitimate purpose, including to and from his or her place of business or to and from a shooting range. The gun must be in a protective case, and out of reach from the driver. It should not be loaded, and ammunition should generally be in a separate area. If the precautions are not followed, and police officer conducts a traffic stop on a driver who has a gun in the car, he or she is at risk of being arrested for gun possession. Remember that out of state concealed carry permits are not valid here. Our defense lawyers have seen many people with valid out of state permits arrested for carrying firearms, including military personnel. Protect yourself, know the state laws, and call a criminal lawyer if you or someone you know has been arrested. In order to sustain a conviction for a carrying a concealed handgun in Maryland, the prosecuting lawyer may also prove beyond a reasonable doubt that the defendant knowingly carried a weapon on his or her person. The state must then also prove that the weapon was a handgun under state law. 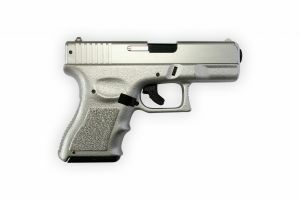 A handgun is any pistol, revolver, or other firearm that is designed to fire a bullet and is capable of being concealed. The crime of carrying a concealed handgun does not include shotguns, rifles, or antique firearms, but can include sawed off shotguns or short barreled shotguns. A shotgun or rifle that is less than twenty six inches can be considered short barreled and fall under the handgun law. Knowing the law is the best way to avoid an arrest, so feel free to contact the Firm for a more detailed explanation. The stakes are simply too high to walk into court unrepresented in any criminal case, especially a case involving a weapon.